Iranian Court Begins Espionage Trial Of 'Washington Post' Reporter : The Two-Way Iran's state news agency says Jason Rezaian, 39, "is accused of espionage for the US government and activity against the Islamic Republic of Iran." 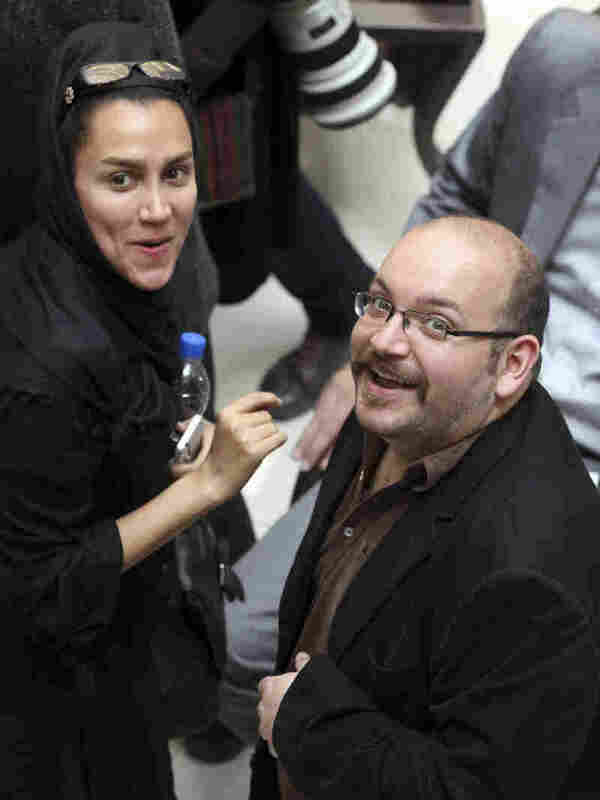 A 2013 photo shows Washington Post reporter Jason Rezaian and his wife, Yeganeh Salehi, a correspondent for the Abu Dhabi-based newspaper The National. Both of them were in an Iranian court Tuesday. More than 10 months after Washington Post reporter Jason Rezaian was detained on vaguely defined espionage charges, his trial began Tuesday in a closed court in Tehran. Rezaian is a citizen of both Iran and the U.S. Noting the trial's start, Iran's Islamic Republic News Agency notes that Rezaian, 39, "is accused of espionage for the US government and activity against the Islamic Republic of Iran." The agency did not note other details about the charges. The Post, citing IRNA, reports, "The proceedings were adjourned after about two hours." The newspaper adds that no "family members or independent observers were permitted inside the courtroom — bringing denunciations from press freedom groups and others." Rezaian is a native of California. He was working as the Post's Tehran bureau chief when he was arrested last July along with his wife, Yeganeh Salehi, an Iranian correspondent for the Abu Dhabi newspaper The National, and another person. Salehi was later released on bail; she was in court Tuesday, according to The National. "They say he was following the internal politics and the foreign politics of the government. So essentially, he was watching the news and reporting on the news — and they're calling that espionage. They also told us that he was collaborating with a hostile power. And their main charge there is that he basically applied for a job with the White House." At the time of his arrest, Rezaian had filed a story about talks over Iran's nuclear program. The day before, he had published a piece about baseball's status as a favorite pastime for some Iranians. Rezaian has remained in jail since his arrest, with only one visit from a lawyer, according to the Post. His trial is being heard by Revolutionary Court Judge Abolghassem Salavati, who is nicknamed "the judge of death" for the way he hands out sentences, according to NPR's Peter Kenyon. From Istanbul, Peter recently told Morning Edition that Judge Salavati is "used to handling politically sensitive cases." An Iranian who fled the country after being in the revolutionary court told Peter that the trial "seemed very scripted, with the judge just reading what was put in front of him." Rezaian's case has lingered amid the prolonged and complicated process of international negotiations with Iran over its nuclear program — a process that has also highlighted divisions between Iran's own political system. President Obama is among those who have urged Iran to release Rezaian, citing the reporter's status as a credentialed member of the media. Obama highlighted the case this spring, along with those of other Americans who are being held in Iran — Idaho's Saeed Abedini and Michigan's Amir Hekmati — along with Robert Levinson, a former FBI agent who disappeared in Iran more than eight years ago.